We all know hot pot, right? Where you dip/blanch vegetables in spicy broth that’s being cooked right in front of you? 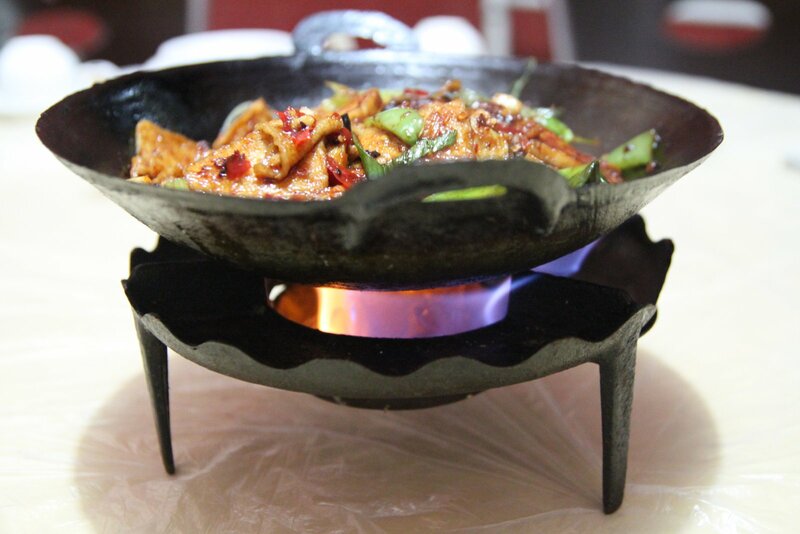 That’s called “huo guo”, fire pot. This is its cousin and a new favorite cooking method of mine. 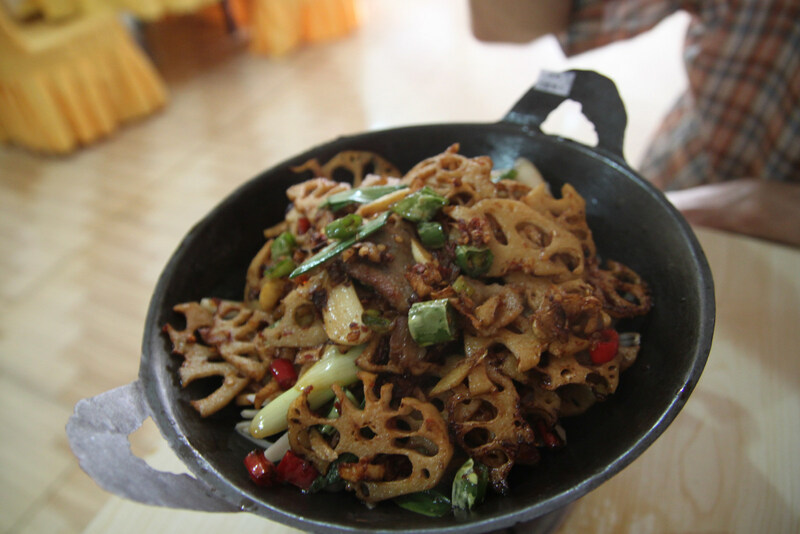 I think it’s called “gan guo,” meaning “dry pot.” They sautee the main stuff – in this case, lotus roots – nice and spicy in advance, then drop it on a pile of raw onions in chili oil, which cook right in front of you. The last bites are even hotter than the first! . 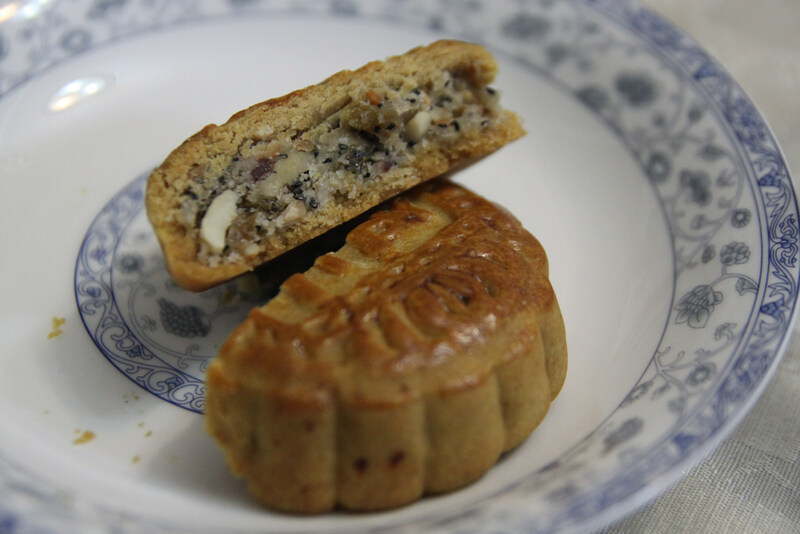 Awesome “yue bing” moon cake pastries traditionally eaten around the autumn full moon holiday that just passed us by. These cakes are super-dense and chock full of nuts, seeds, weird little jellies, and typically 100% vegan. Plus, you can often buy them plastic-free out of big tubs. I hope they’ll be in production all year round. Tofu and celery gan guo. 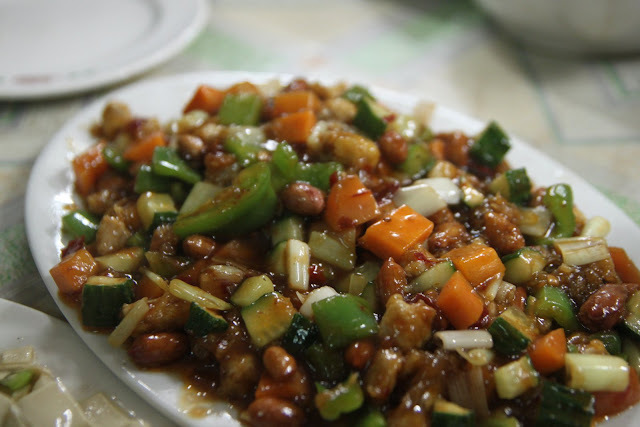 Real Kung Pao Chicken, with enough vegetables and peanuts that I can pick at it. 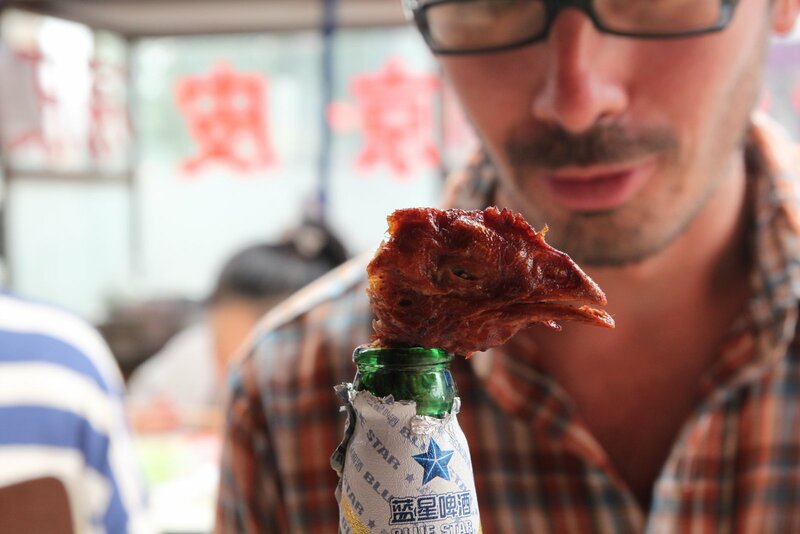 Quote from Xiang Liang: “I think that if you’re going to order a chicken, you should be man enough to eat the feet and heat too.” Well said. Also, the sphincter. 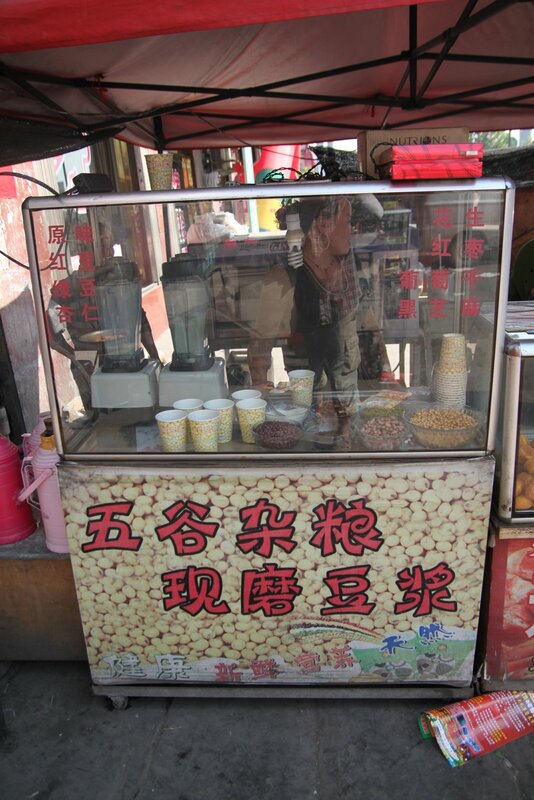 I’m very grateful to Xiang Liang for introducing us to more and better street food. 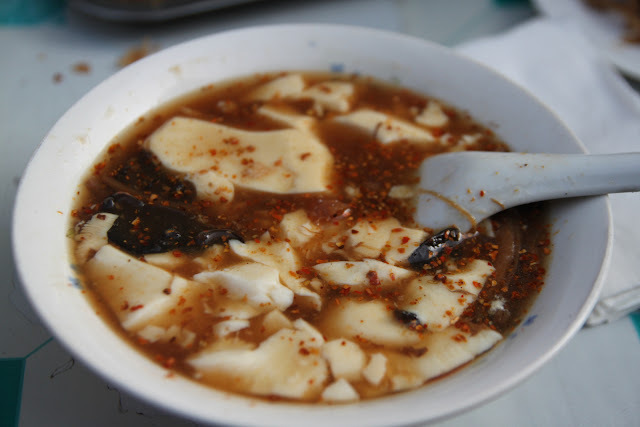 This one is “Dou fu lao,” meaning tofu something. It’s a big spoonful of runny tofu in salty bean broth, to which you then add your own pickled radishes, red pepper flakes, and cilantro. A steaming hot bowl at breakfast costs about twenty five or fifty cents, and along with a handful of fruit, is enough to keep me riding until lunch. La pi (spicy skins?) 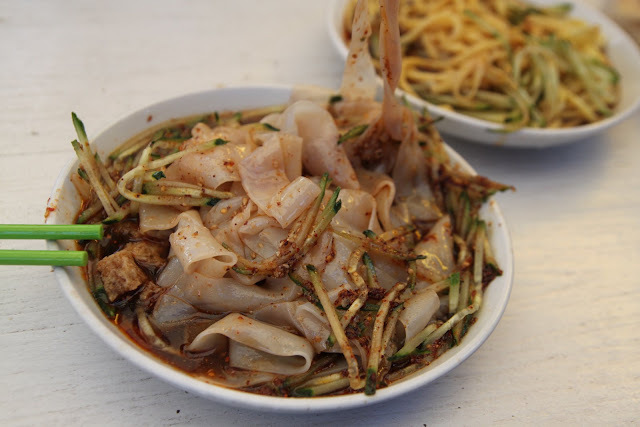 street noodles. Slippery so a bit tough to eat but ohhhh so good. Typically 3RMB, less than fifty cents. 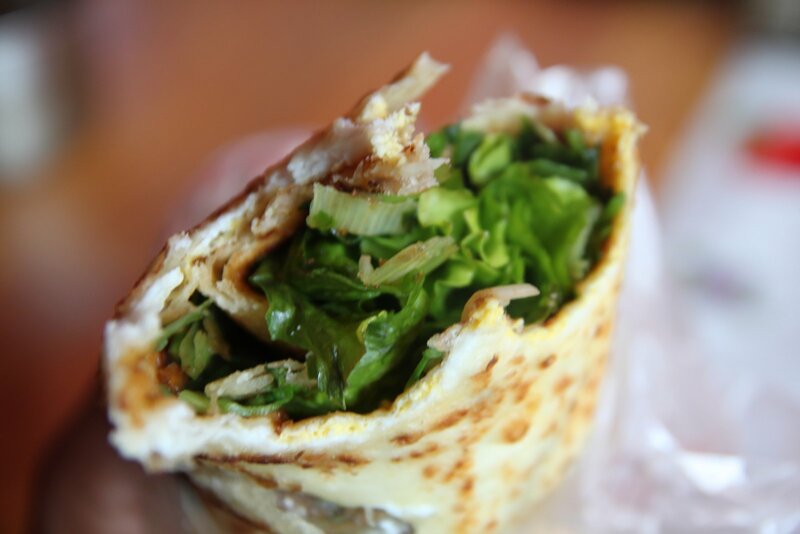 A Chinese burrito! Frickin’ amazing! They take a simple flour and water dough, spread it thin, and fry it a little on a griddle. Just before it’s done, they poke a hole in the middle, drop in some beaten eggs, and then smush them around with a spatula so that they kind of coat the whole crepe. Add sauce, pepper flakes, lettuce, and cilantro and you have an awesome little snack. The price was 3RMB, but they gave Mingyu one for free, probably because he so enjoyed taking pictures of them cooking. Then I went back to buy two more, and they gave me those for free as well. Jeez, people! Also that morning: fresh nut milk! Fresh soy milk is a staple at breakfasts here and costs about a quarter a bowl. People usually dunk Chinese-style donuts into it while eating. I hadn’t seen this before though – they blend up soy beans, peanuts, black beans, adzuki beans, green lentils, jujubes, and a little sugar right in front of you to make an awesome vegan beanshake. The jujubes add just the right kind of maple-ish depth and cover the weird beany taste nicely..
Tofu gan guo in action. After a long day of climbing – this was the first time we would sleep at over 1000m – I was coming down with a cold and needed something to warm me up. Xiang Liang suggested this: tangerine and white cow’s ear mushroom soup Actually, he only said tangerine soup, which was probably a good way to sell it. Amazing stuff! It was like drinking a tub of slightly thinned down orange marmalade. The three of us generally share one meat dish (at which I pick slightly resentfully) and one veggie dish, and then each get our own individual “ju shi,” which means something like “staple food” but is really just the category of starchy foods. Plain rice, fried rice, noodles in broth, fried noodles, etc. When there’s some other ju shi on the menu, though, we usually go for it. 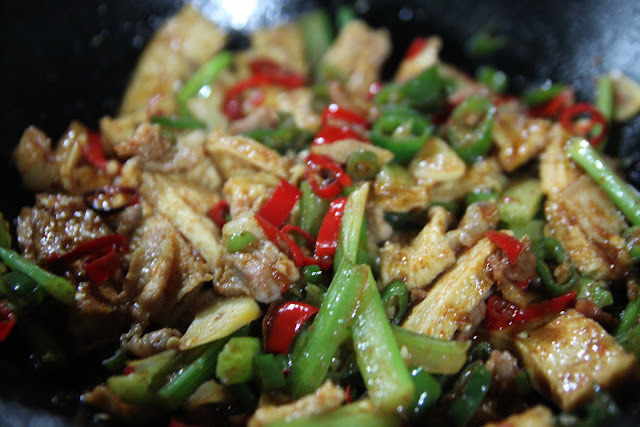 This one was pretty random – dough flakes stir-fried with potatoes and green beans and maybe (?) some sort of tomato paste? Awesome, if a bit heavy. Could have been a meal all on its own. 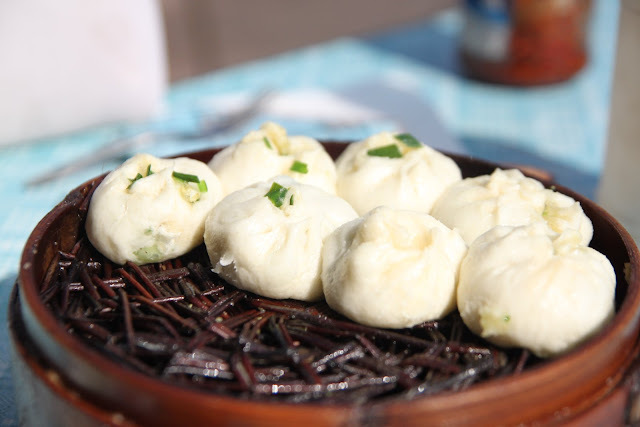 Fresh, steaming chive and egg dumplings in the morning! I guess I can kiss these goodbye. Thanks, renewed commitment to veganissm and goddamn truckful of pigs. And a new favorite food that really has become a staple. Chao (same as Chow from Chow Mein, which means “stir fried”) Bing (which means bread, cake, pastry). Chao bing. 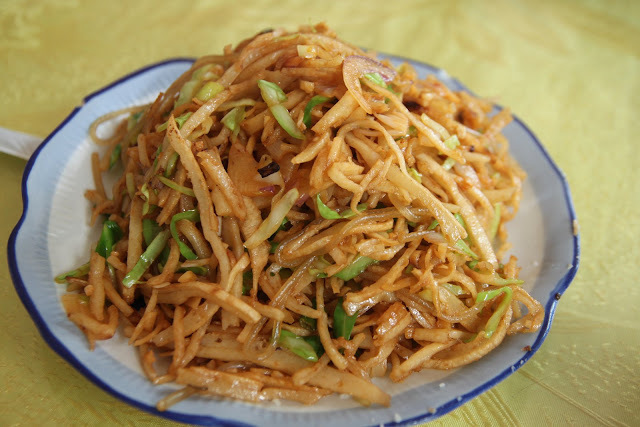 Slices of simple, unleavened, tortilla-type bread dried and then stir-fried with onions, chines, bean sprouts, eggs, or cabbage. Chewy, oily, dense, super-filling, vegan on request, and cheap as all get-out. Hello, 7RMB/ $1 and some change. On days off, when I have the luxury of sitting around in one place for more than an hour and doing dishes doesn’t sound like a chore, I like to do a little saladifiying. In fact, I did a mostly raw-and-whole food purge that day. So, at the local grocer, I got a cuke, a carrot, spinach, spring onions (much easier to cut with a pocket knife than standard onions, and also easier both to store and to eat raw), a tomato, fresh sprouted beans (not quite old enough to be bean sprouts), and, for flavor and substance, fried and salted peanuts. Made 2 giant bowls that I could barely finish. 7RMB / $chump change. Yeah yeah yeah good eats, every day! ← Week 5 and 6 Photo Barrage! Dude your food posts make me so hungry. Regarding the eggs – what if you knew they were from well-raised hens? Stepp, I’ll put up a post about veg*anism on the road soon. The short answer, though, is that I would if I were sure.